This would be a great addition to your employee's health and benefits program. 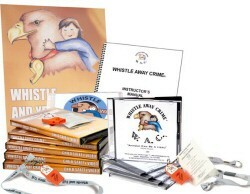 It will teach your employees and their families' safety through our Whistle Away Crime® easy, interactive videos. Appropriate for groups and organizations of all kinds: Churches, Boy Scouts, Girl Scouts, Childcare Programs, Schools, etc.